Last week I showed you a sneak peek into my new attic bedroom with the new bed, and today I want to take it a step further and showcase some amazing new Luxaflex blinds I’ve had installed. The attic space has been extended with a dormer on the back of the house, containing the en-suite bathroom and large bedroom window overlooking the gardens. 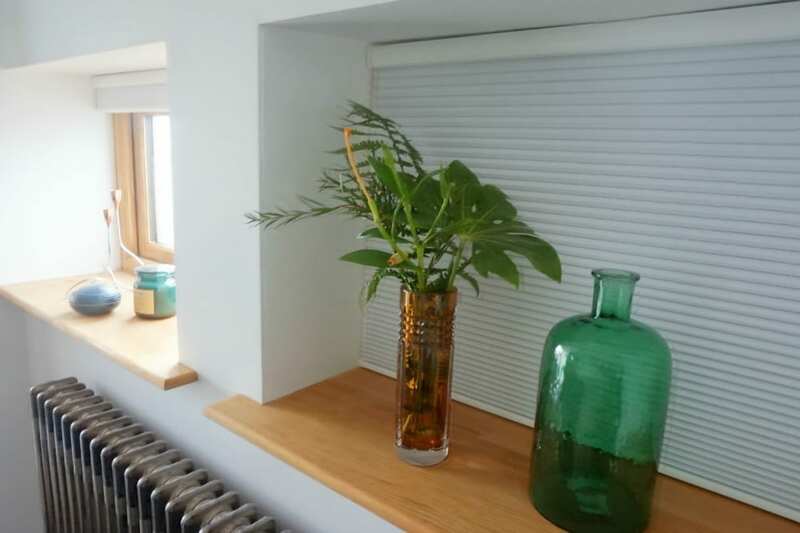 Our architect also incorporated a Velux (there is another Velux window on the stairs too) and some smaller side windows (above), made from Douglas Fir wood. Consequently the room is incredibly light, which we love. Dressing windows of different styles and sizes is always really difficult, and as we wanted the room to be sleek and calm, the treatments needed to be simple. In the past I’ve just used simple roller blinds, sometimes in a sheer fabric for a contemporary feel, or I’ve gone for roman blinds. These just didn’t feel right for this room. I wanted something a little different, something unusual that tied in well with the decor, but didn’t detract from the stunning wood windows. 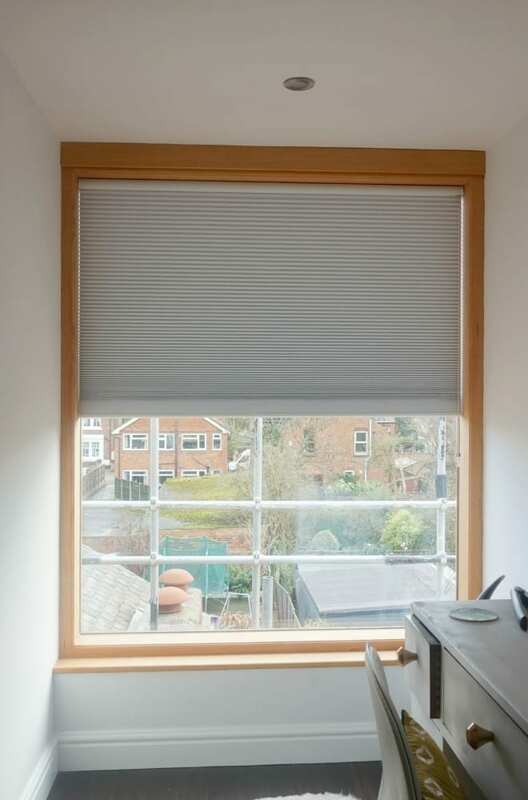 Luxaflex suggested we try the Duette Shades range of blinds, particularly as they manufacture a Velux window blind and would give us the look we were after. 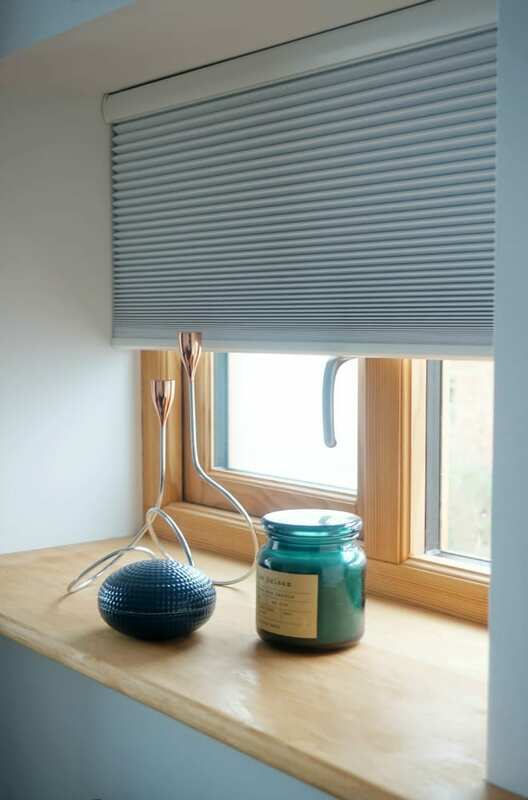 Duette Shades feature a honeycomb effect pleated blind. They are highly energy efficient with the still layer in the cell working like an insulating blanket, and come in several different width options, colourways with additional features too. We are keen to see how help keep the loft warm, particularly over the Winter and Christmas period. Normally, a Luxaflex design expert would pop along to your home, discuss the product, show you samples and measure up. However, there wasn’t a Luxaflex expert local to us, so we popped along to John Lewis, where we could view the range and look at the colours. This was actually quite handy; we got to see some of the products on display, and checked out all the different colourways. Many of the colours are very neutral and just a shade different from each other, but the sample products allow you to see how the colours will work once the pleat is opened up. Measurements of the new windows were taken and sent to Luxaflex. Within a few weeks the blinds arrived. Perfect. Installation was actually incredibly quick and easy. (I didn’t take any images unfortunately as we did them at night time). All that you need to do is screw in the metal casings at the top of the window, and then click the blind into place. They fit perfectly. The Velux window was a little more complicated, but the instructions were clear and we were sorted within 20 minutes. I chose the blackout blind feature as I do like a dark bedroom. And we went for the Smartcord operating system which is extremely safe for children. A lovely feature. With such a large blind I was concerned there would be pools and pools of cord on the floor once the blind was raised, but I’ll show you how this works further down the post. 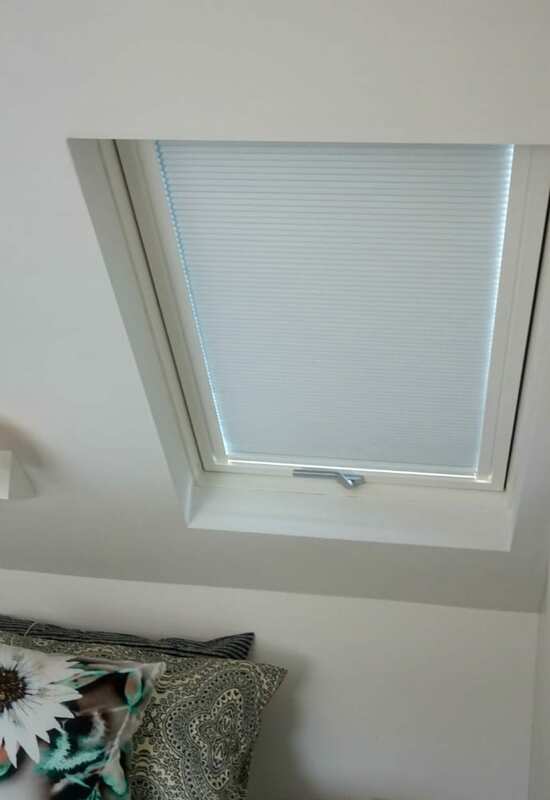 Both the large window and side windows have a 32mm pleat, whilst the Velux houses a 24mm pleat blind. And I’ve kept the colourway simple with an off-white. We’ve been using the blinds in situ for about a week now and I am totally in love with them. (When can I do the rest of the house?). There are two main features of the Luxaflex blinds which have resonated with us, the fit and the quality. You can see from the images how well they fit. They’re made so well, and accurately, that the fit is incredible. And that’s really useful when you want them to block light as a blackout blind. The overall quality of the product is also very high. 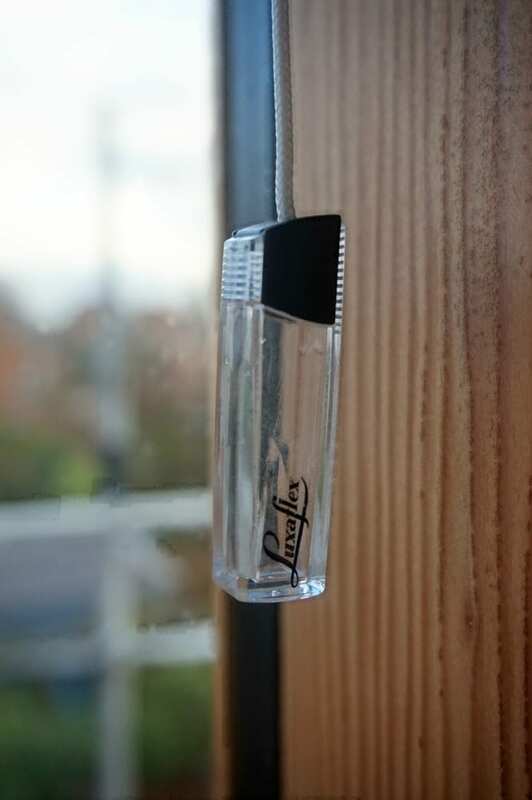 The mechanisms all work smoothly and effortlessly; even the cord pull is beautifully styled. And the material feels robust yet looks delicate. So, back to the Smartcord. 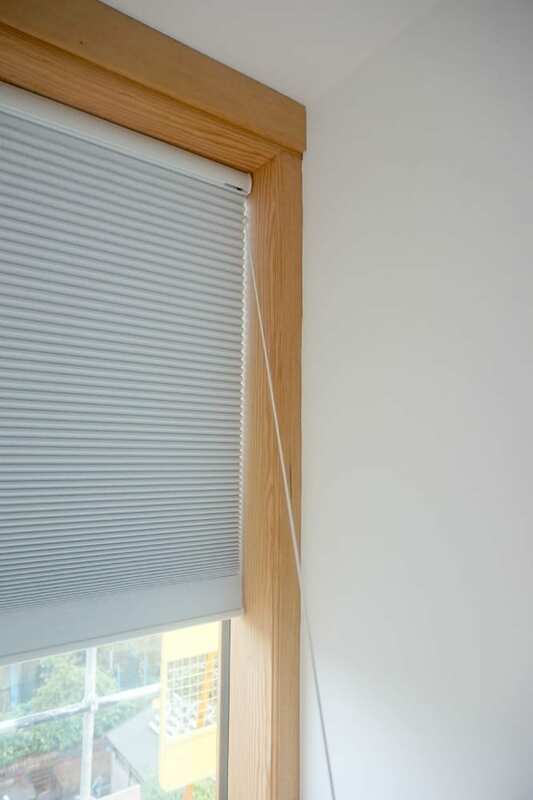 Pull the cord to raise the blind then release, and the cord retracts back into the casing. Keep pulling to further raise the blind, and the cord will keep retracting. It never gets any longer than the length you see in the pictures. Genius. In terms of keeping them clean, I’ll just dust lightly, or use a slightly damp cloth if they get marked. They easily clip out of their casings if you need to take them down for any reason, decorating perhaps. 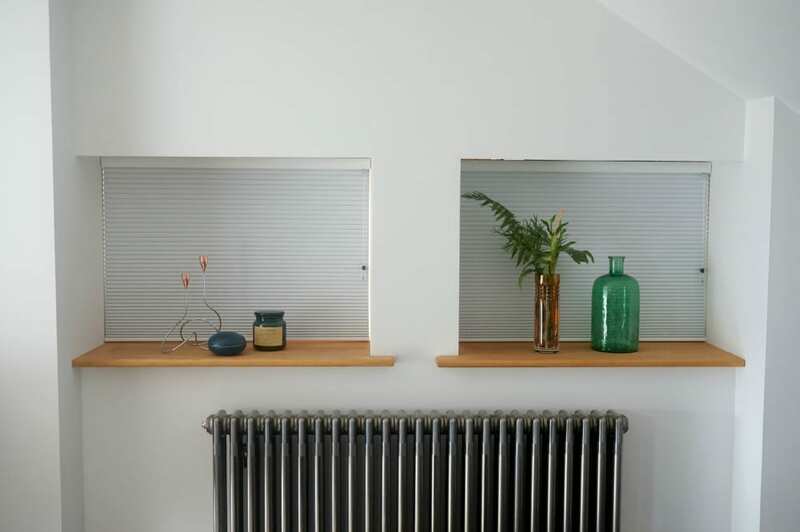 For us, looking for a contemporary and simple yet classy window dressing the Luxaflex blinds are the perfect solution. I absolutely couldn’t me happier, and would wholeheartedly recommend that you look into them if this is the kind of style that you would like. You can find out more about Luxaflex and their range of products HERE. Now if you fancy having a go at winning Luxaflex blinds for your own home or an amazing trip to Milan, Luxaflex are running a wonderful competition called #MyStyleEye, where you can send in image that captures interior style for you. You can enter as many times as you like too. Find out more about the competition HERE. The luxaflex blinds were gifted for the makeover, but the comments and opinions are genuine and honest. Oh these are so good, neat and contemporary, but would equally look good in any kind of decor. Brilliant! I’ve never been a massive fan of blinds but these actually look really nice and of a good quality. I love the fact that they sit right up against the edges. No gaps to let light in, you don’t get that normally with blinds. Hmmm…. perhaps these are the way to go with my bedroom. You already know how much I love shopping for curtains…! 🙂 Looks great Jen, really sleek but functional too. Good choice!